HOUSTON (CN) – A Texas wildlife lover took her fight to free four white tigers to federal court Tuesday, claiming their cramped quarters at a Houston aquarium and confinement indoors there for 13 years violates the Endangered Species Act. 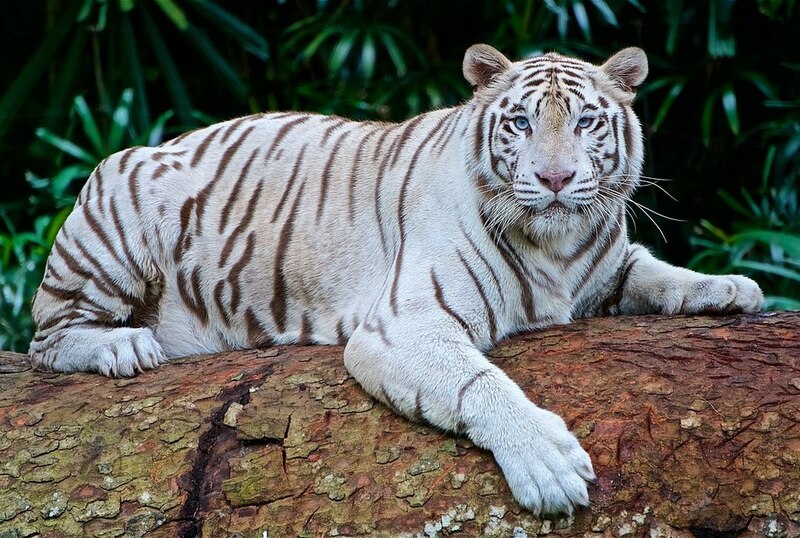 The four white Bengal tigers — Nero, Marina, Coral, and Reef — were bred in captivity and brought to the Downtown Aquarium in Houston as cubs shortly after it opened in 2003. The Downtown Aquarium, which occupies 6 acres and has two restaurants and 500,000 gallons of water in its aquariums, is one of the city’s most popular tourist attractions. Screams from people on its carnival rides mingle with those of children frolicking in its splash pad, which shoots jets of water up from the pavement, and its Ferris wheel stands sentinel at night over bustling Interstate 45, bathing passing cars in garish light by turns blue, green, red and orange. Aquarium owner Landry’s Inc. displays the tigers behind glass in a dimly lit enclosure meant to resemble the interior of a sultan’s temple. Plaintiff Cheryl Conley, a grandmother of three, got a behind-the-scenes tour of the tigers’ living conditions in 2015 and was shocked to learn they are held in 100-square foot metal cages for at least 12 hours a day, and spend the rest of their time lounging or pacing in the exhibit area. “Most troubling, the tigers have not been outside for more than 13 years,” the complaint states. Conley sued Landry’s Inc. and its subsidiary Houston Aquarium. Conley says that as the owner of a small, nonprofit radio station, she decided in 2015 to start a radio program to profile area wildlife. She picked the Downtown Aquarium for the first show and Landry’s public relations firm gave her a tour. She says she abandoned the show idea after she saw the tigers’ appalling living space, with its concrete and metal flooring, small windows and a skylight providing the cats with a meager amount of natural light. “Instead, Ms. Conley chose to use the time she would have spent on the radio program to advocate for improvements to the aquarium tigers’ living conditions,” the complaint states. Landry’s general counsel told Courthouse News on Tuesday night it is confident it will fend off Conley’s federal lawsuit because it has plans to add an outdoor area to the tigers’ exhibit, with a waterfall, pool, rock features and fake trees for the tigers to climb. It plans to open the improved exhibit in 2018. Conley’s lawsuit follows up on a notice of intent to sue for Endangered Species Act violations, with which she and the Animal Legal Defense Fund served Landry’s in September 2016. They issued an accompanying news release in which a veterinarian blasted Landry’s for holding the tigers in “dungeon-like conditions.” In the federal lawsuit, they claim that the tigers are being harmed and harassed. The notice led Landry’s to sue Conley, the Animal Legal Defense Fund and its senior counsel in state court in November 2016, claiming they defamed it with statements in the letter that the tigers didn’t have room to run or jump and live entirely on concrete and metal. Harris County Judge Steven Kirkland sided with Conley and the defense fund, awarding them $450,000 in sanctions under the Texas Citizens Participation Act, an anti-SLAPP statute, and more than $170,000 in attorney’s fees, in February this year. Landry’s appealed. Conley uses Landry’s credentials for the Downtown Aquarium and its Aquarium in Denver against it in her lawsuit, claiming that they alone out of 231 zoos accredited by the Association of Zoos and Aquariums do not abide by the association’s recommendations to provide outdoor space with natural light for tigers. She seeks a declaration that Landry’s has violated the Endangered Species Act for 13 years by putting the tigers in holding cages for long periods of time and keeping them indoors. Conley is represented by Kristen Schlemmer with Irvine Conner in Houston and Anthony Eliseuson with the Animal Legal Defense Fund in Chicago. The Downtown Aquarium is part of the empire of restaurant and casino owner Tilman Fertitta. Fertitta’s forebears emigrated to Texas from Sicily, and he grew up in Galveston, 50 miles southeast of Houston. Fertitta, 60, has an estimated net worth of $3.1 billion. He agreed this month to buy the Houston Rockets for $2.2 billion, which will be the highest price ever paid for an NBA franchise when NBA officials approve the deal.